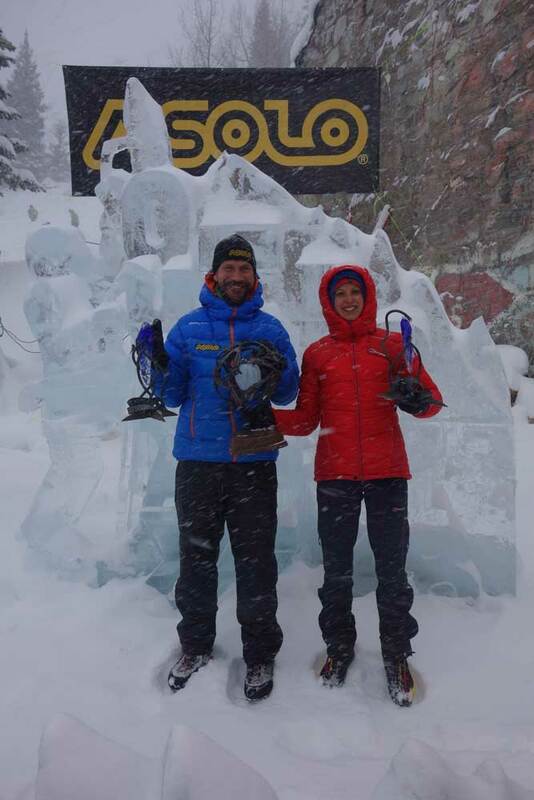 Nathan Kutcher has once again won the prestigious Ouray Ice Fest. 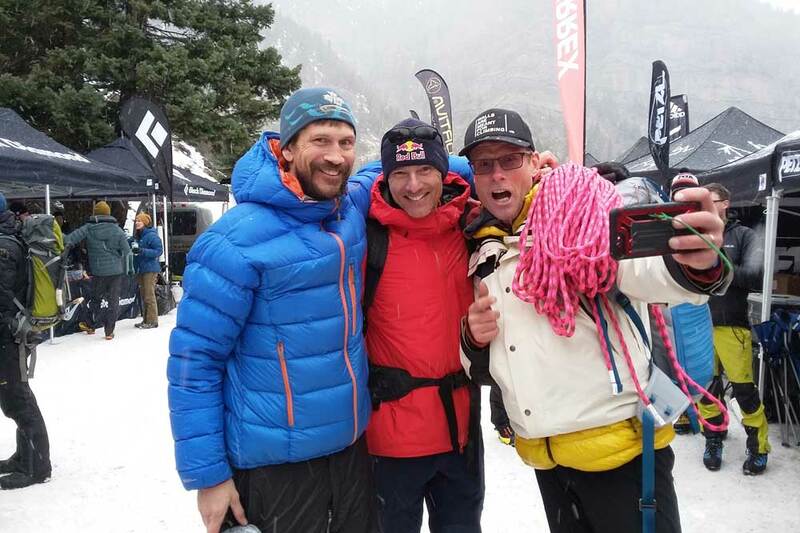 2018 Ouray Ice Fest Winner Nate Kutcher (L) with Will Gadd (C) and Conrad Anker (R). Kutcher battled against a strong field that included talented climbers like Will Gadd, Sam Elias and Ryan Vachon. In a nail-biting finish that almost replicated last year’s results, Kutcher bagged the win by completing the route four seconds faster than second-place finisher Vachon. In the 2017 Ouray Ice Fest the roles were reversed with Vachon beating Kutcher by just a 10-second margin. Nathan Kutcher on his way to victory at the 2018 Ouray Ice Fest. Based in Ontario, Kutcher gained recognition in the competitive ice climbing scene when he seemingly came out of nowhere and won the 2012 Ouray Ice Fest. 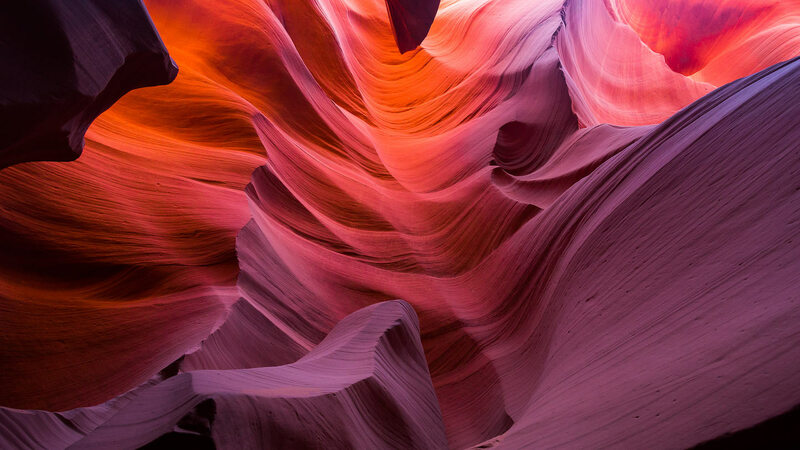 He followed this feat with a number of stunning difficult mixed climbs including the traditionally protected ground-up ascent of Metamorphosis M10 R as well as onsights of difficult mixed climbs up to M12+. Nathan Kutcher and Angelika Rainier at the 2018 Ouray Ice Fest. Kutcher travels and climbs with his wife, Rebecca Lewis. They are both members of the Canadian National Ice Climbing team and compete internationally on the World Cup ice climbing circuit. Lewis finished fifth overall in the women’s division at this year’s Ouray Ice Fest.